There's a lot more hay in the barn than there was yesterday morning, but we're not done yet. There are 100+ bales still on the trailer, a large swath of cut hay laying out in the field, and two extremely weary hayers who slept in and are now racing the coming rainstorm. But the hay looks better than it has in years. WOW That is beautiful hay. Brings back memories of frying chicken, whipping potatoes and gravy for the guys in the field. Then, we'd drive out and take it to them with quart jars to fill with iced tea. I never envied their work...just the fact that they always got the best pieces of the chicken. I know how great you will feel when it's all in the barn and you finally get to wash it off. God bless our farmers! 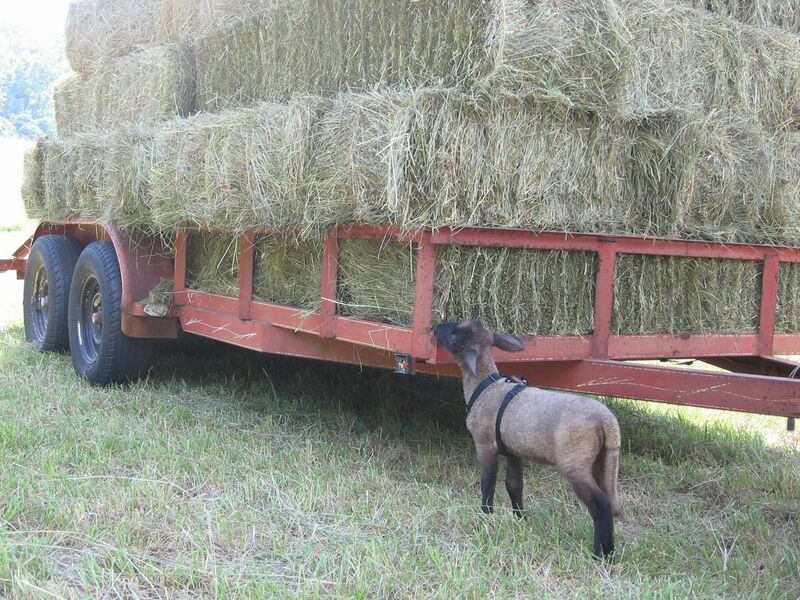 I presume the Inspector deemed the hay good? Cary has a harness and a lead? That sheep is going to think it's a dog! Boy oh boy, your little one is getting so big! And hard working! Good to see that you band-dock tails nice and long. No prolapse/sunburn for YOUR lambs!